The Galle Magistrate today issued an order preventing former Defence Secretary Gotabhaya Rajapaksa, former Navy Commander Admiral Somathilaka Dissanayake and two others from leaving the country. The other two persons who were imposed the travel restriction were the Director of the Rakna Arakshaka Lanka (Pvt.) Limited, Major General (Retd) K. B. Egodawela and Manjula Yapa, the Managing Director of Avant Garde Security Services (Pvt.) Limited. Police Spokesman ASP Ruwan Gunasekara said the CID has requested the travel restriction to facilitate the investigation on the floating armoury of Avant-Garde at Galle Harbour. 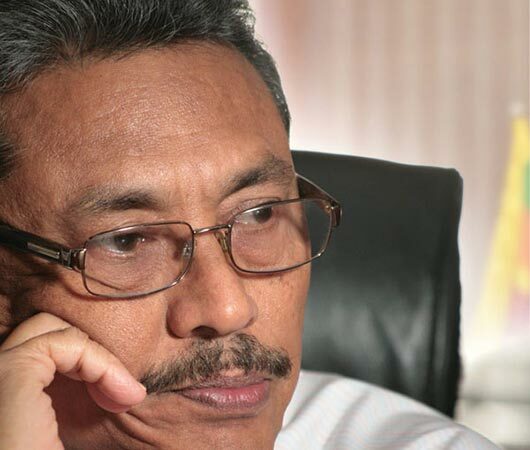 Gota must be punished severely for lasantha’s murder. Gota. Must be punished severely for all the crimes he committed and for the number of murders he has committed.